RUSH: Well, this one had to be a tough one for CNN to report. They’ve got some polling data on what people think of the economy out there. Just saw it up there. 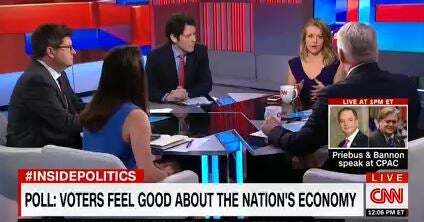 Sixty-one percent of Americans report feeling very good about the economy. Thirty-seven percent, no. And by the way, I think we’re back. You know, when Obama was president and he was providing stewardship over a flagging economy it was the first time in my life that the state of the economy had no impact on presidential approval numbers. We’ve got Trump in the Oval Office now and how the economy is perceived is gonna be very, very important to him in terms of giving him insurance on the rest of his agenda and getting approval numbers overall on job performance and this kind of thing. So I think we’re back to a state of normal there. … Now, the Inside Politics, Trump approval rating at 38%, does that jibe with what people think about the economy? Inside Politics: “Trump approval rating, 38%.” They’re just reveling in that. Anyway, my friends, I’m leading off with something that just hit right before the program began on Politico. It’s a story about John Boehner, and the headline is, “Boehner: Republicans Won’t Repeal and Replace Obamacare. — Former House Speaker John Boehner predicted [today] that a full repeal and replace of Obamacare is ‘not going to happen. '” He was “at an Orlando health care conference that the idea that a repeal-and-replace plan would blitz through Congress is just ‘happy talk.’ Instead, he said changes to former President Barack Obama’s signature legislative achievement would likely be relatively modest. “‘(Congressional Republicans are) going to fix Obamacare — I shouldn’t call it repeal-and-replace, because it’s not going to happen,’ he said. 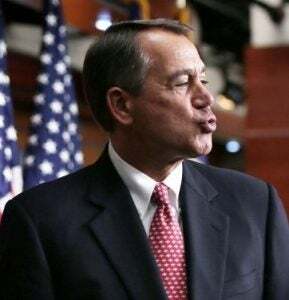 Boehner’s comments come as Republican lawmakers across the country are facing angry constituents at town halls worried that Obamacare will be yanked away without a suitable replacement.” Is that what Republicans are protesting? Look, I don’t deny that there are Republicans showing up at these town halls. By the way, don’t anybody misunderstand me here, and I don’t deny that some of them are angry, but they’re not angry that the Republicans might repeal Obamacare. If they’re angry at anything, it’s that they haven’t yet. But look at the way this is written here at The Politico: “Boehner’s comments come as Republican lawmakers across the country are facing angry constituents at town halls worried that Obamacare will be yanked away without a suitable replacement. President Donald Trump has said in recent days that he will release a plan by early to mid-March on how the administration plans to move forward on a repeal-and-replace plan. [Today], Boehner said the talk in November about lightning-fast passage of a new health care framework was wildly optimistic. ‘I started laughing,’ he said. ‘Republicans never ever agree on health care.’ ‘Most of the framework of the Affordable Care Act … that’s going to be there,’ Boehner concluded.” It’s going to remain. Let me rephrase this again. I’m not saying legitimately give them cover. I’m saying does it give them an excuse? ‘Cause you know some of them don’t want to mess with it. Some of them don’t want to get anywhere near it, because in their view, it’s an entitlement, and we never take those away. I’ll tell you what I want to do here, folks, because the protesters that are showing up at these town halls are, again, being mischaracterized and they are being mis-defined. It turns out that in fact much of what’s going on here is actually brought to us by an Obama organization, Organizing for Action. I mean, there are no excuses. Republicans have the White House, they have the House, they have the Senate. The Democrats cannot stop the Republicans with votes. They cannot stop. In the Senate there’s the 60 votes thing, but they can’t stop this. 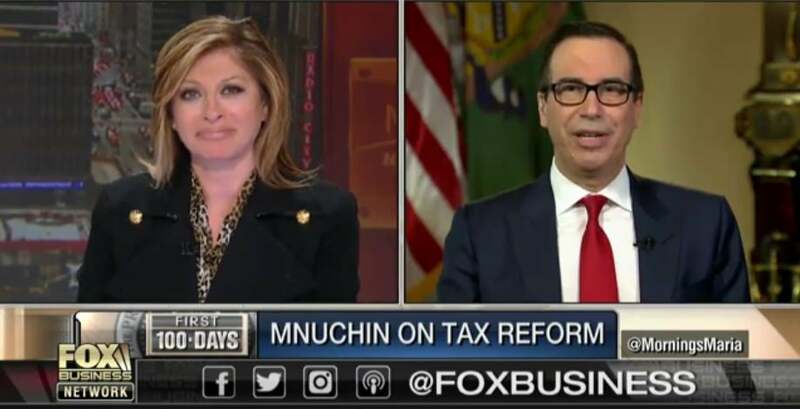 “During an interview with the FOX Business Network’s Maria Bartiromo Treasury Secretary Steven Mnuchin said the administration is ‘focused on an aggressive timeline‘ to produce a tax reform plan by August.” Now, wait a minute. There’s nothing “aggressive” about a tax reform plan being produced by August. I’d like to remind you that Ronaldus Magnus signed the first phase of his massive tax cuts in August of 1981. Eight and a half, nine months after being sworn in, Reagan signed his first wave of tax reform. The Treasury secretary said with Maria Bartiromo that they’re “‘focused on an aggressive timeline’ to produce a tax reform plan by August.” Well, okay, you produce a plan by August. That’s during the congressional recess, is it not? Okay. These are the people that are putting on the CPAC conference, which starts together and goes through Saturday. “ACU Chairman Matt Schlapp tells the Washington Examiner the Trump Cabinet has a 91.52 conservative rating, which exceeds Reagan’s Cabinet rating of 63.43.” Now, how are Never Trumpers gonna deal with that? No, seriously! Trump has appointed a more serious cabinet than even Reagan, according to the American Conservative Union. Trump has already… This business of getting rid of the federal rule on transgenders using bathrooms and sending it back to the states? It was just a letter demanding that anybody who wanted to use a bathroom of their choice, as long as they said they were transgender, you have to stand aside and let them. And he put it under Title IX, which has been bastardized as well. I mean, the way to look at that, Donald Trump just took a step to restore order to America’s educational system. Barack Obama improperly and very frequently usurped the power and the proper role of state and local school boards with his transgender bathroom directive, which was nothing more than a letter! It’s state and local taxes that pay for schools. School boards are in charge of and maintain schools. Like if you wanted I could read you the role of school boards, according to the Center for Public Education. I won’t bother with that, but what Obama did was bring chaos, and purposely so. Because the Democrats and Obama were all about upending traditional American culture in any way they could. It was part of transforming America away from the country as founded. Certain laws would be unenforced. Law enforcement would be neutered. Separation of Power would be consolidated, federalism ignored, and of course Obama governed against the will of the people, and Trump’s restoring order to all of this with his immigration requirements now. All this is, all Trump has done regarding immigration is simply go back to the 1965 immigration law that the Democrats demanded back then! That was the law that Senator Kennedy demanded. Again, I remind you: We suspended all immigration in this country from 1921 to 1965. And we did that so that all of the immigrants prior to 1921 could assimilate and become Americans. It takes time. And the Democrats began to get worried, constituencies and all, and they moved to reopen immigration in 1965, and we got a bill, and those are the laws… They’ve been updated, obviously, since 1965, but it’s essentially that piece of legislation that’s simply being reinforced now, that the Democrats are having kittens about. Much more detail on all of this as the program unfolds right before your very eyes and ears.